We report a reproducible fabrication process ensuring repeatable absorption and emission properties of bismuth (Bi) doped silica-glass optical fibers (BDFs) with single-mode operation above ∼800 nm. BDFs were fabricated through a modified chemical vapor deposition process in-line with the solution-doping technique. Lithium-germanosilicate, yttrium-germanosilicate, and yttrium-phosphosilicate glasses were used as hosts for Bi. Bi and other dopant concentrations were measured by EPMA. ∼0.07wt% of Bi content is obtained with a transparent core. The absorptive and emissive properties of BDFs in the VIS-NIR range (targeted onto 600-900 nm) were studied thoroughly. This study is oriented to the development of VIS/NIR lasers and amplifiers, using BDFs of this type. E. M. Dianov, V. V. Dvoyrin, V. M. Mashinsky, A. A. Umnikov, M. V. Yashkov, and A. N. Gur’yanov, “CW bismuth fibre laser,” Quantum Electron. 35(12), 1083–1084 (2005). I. A. Bufetov and E. M. Dianov, “Bi-doped fiber lasers,” Laser Phys. Lett. 6(7), 487–504 (2009). V. V. Dvoyrin, V. M. Mashinsky, L. I. Bulatov, I. A. Bufetov, A. V. Shubin, M. A. Melkumov, E. F. Kustov, E. M. Dianov, A. A. Umnikov, V. F. Khopin, M. V. Yashkov, and A. N. Guryanov, “Bismuth doped-glass optical fibers-a new active medium for lasers and amplifiers,” Opt. Lett. 31(20), 2966–2968 (2006). V. V. Dvoyrin, A. V. Kir’yanov, V. M. Mashinsky, O. I. Medvedkov, A. A. Umnikov, A. N. Guryanov, and E. M. Dianov, “Absorption, gain, and laser action in Bismuth-doped aluminosilicate optical fibers,” IEEE J. Quantum Electron. 46(2), 182–190 (2010). I. Razdobreev, L. Bigot, V. Pureur, A. Favre, G. Bouwmans, and M. Douay, “Efficient all-fiber bismuth-doped laser,” Appl. Phys. Lett. 90(3), 031103 (2007). I. A. Bufetov, S. V. Firstov, V. F. Khopin, O. I. Medvedkov, A. N. Guryanov, E. M. Dianov, , et al., “Bi-doped fiber lasers and amplifiers for a spectral region of 1300-1470 nm,” Opt. Lett. 33(19), 2227–2229 (2008). M. P. Kalita, S. Yoo, and J. Sahu, “Bismuth doped fiber laser and study of unsaturable loss and pump induced absorption in laser performance,” Opt. Express 16(25), 21032–21038 (2008). E. M. Dianov, “Bismuth-doped optical fibers: a challenging active medium for near-IR lasers and optical amplifiers,” Light: Sci. Appl. 1(12), e12 (2012). 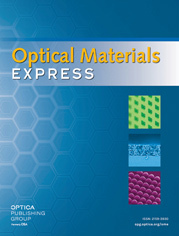 W. Xu, M. Peng, Z. Ma, G. Dong, and J. Qiu, “A new study on bismuth doped oxide glasses,” Opt. Express 20(14), 15692–15702 (2012). N. Zhang, J. Qiu, G. Dong, Z. Yang, Q. Zhang, and M. Peng, “Broadband tunable near-infrared emission of Bi-doped composite germanosilicate glasses,” J. Mater. Chem. 22(7), 3154–3159 (2012). A. Halder, S. K. Bhadra, S. Bysakh, M. C. Paul, and S. Das, “Strong and broad visible emission of Bismuth doped nano-phase separated yttria-alumina-silica optical fibers,” Curr. Nanosci. 12(3), 309–315 (2016). A. Halder, E. H. Sekiya, and K. Saito, “Fabrication and optical analysis of bismuth doped germanosilicate preforms to develop ∼830 nm fiber laser,” in Advanced Photonics 2018 (BGPP, IPR, NP, NOMA, Sensors, Networks, SPPCom, SOF), OSA Technical Digest, JTu5A.62 (2018). V. Parihar, B. Bhatia, and S. Singh, “Optical absorption study of different concentration of Nd3+ ion in Zinc Lithium Bismuth Borate glass,” Int. Arch. App. Sci. Technol. 5, 65–69 (2014). H. M. Oo, H. Mohamed-Kamari, and W. M. D. Wan-Yusoff, “Optical properties of Bismuth Tellurite based glass,” Int. J. Mol. Sci. 13(4), 4623–4631 (2012). Y. Fujimoto and M. Nakatsuka, “Optical amplification in bismuthdoped silica glass,” Appl. Phys. Lett. 82(19), 3325–3326 (2003). E. M. Dianov, A. A. Krylov, V. V. Dvoyrin, V. M. Mashinsky, P. G. Kryukov, O. G. Okhotnikov, and M. Guina, “Mode-locked Bi-doped fiber laser,” J. Opt. Soc. Am. B 24(8), 1807–1808 (2007). E. M. Dianov, A. V. Shubin, M. A. Melkumov, O. I. Medvedkov, and I. A. Bufetov, “High-power cw bismuth-fiber lasers,” J. Opt. Soc. Am. B 24(8), 1749–1755 (2007). E. M. Dianov, S. V. Firstov, V. F. Khopin, O. I. Medvedkov, A. N. Guryanov, and I. A. Bufetov, “Bi-doped fiber lasers operating in the range 1470-1550 nm,” Quantum Electron. 39(4), 299–301 (2009). M. A. Melkumov, I. A. Bufetov, A. V. Shubin, S. V. Firstov, V. F. Khopin, A. N. Guryanov, and E. M. Dianov, “Laser diode pumped bismuth-doped optical fiber amplifier for 1430 nm band,” Opt. Lett. 36(13), 2408–2410 (2011). A. V. Shubin, I. A. Bufetov, M. A. Melkumov, S. V. Firstov, O. I. Medvedkov, V. F. Khopin, A. N. Guryanov, and E. M. Dianov, “Bismuth-doped silica-based fiber lasers operating between 1389 and 1538 nm with output power of up to 22 W,” Opt. Lett. 37(13), 2589–2591 (2012). Y. Fujimoto and M. Nakatsuka, “Infrared luminescence from bismuthdoped silica glass,” Jpn. J. Appl. Phys. 40(Part 2), L279–L281 (2001). B. Denker, B. Galagan, V. Osiko, I. Shulman, S. Sverchkov, and E. Dianov, “Absorption and emission properties of Bi-doped Mg–Al–Si oxide glass system,” Appl. Phys. B 95(4), 801–805 (2009). M. A. Hughes, T. Suzuki, and Y. Ohishi, “Compositional optimization of bismuth-doped yttria–alumina–silica glass,” Opt. Mater. 32(2), 368–373 (2009). T. Schaller and J. F. Stebbins, “The structural role of lanthanum and yttrium in aluminosilicate glasses: A 27Al and 17O MAS NMR study,” J. Phys. Chem. B 102(52), 10690–10697 (1998). A. Halder, M. C. Paul, S. W. Harun, S. K. Bhadra, S. Bysakh, S. Das, and M. Pal, “Visible and near infrared up-conversion luminescence in Yb3+/Tm3+ co-doped yttria-alumino-silicate glass based optical fibers,” J. Lumin. 143, 393–401 (2013). M. Qian, C. Yu, J. Cheng, K. Li, and L. Hua, “The broadband NIR emission properties of Bi doped La2O3–Al2O3–SiO2 glass,” J. Lumin. 132(10), 2634–2638 (2012). V. O. Sokolov, V. G. Plotnichenko, and E. M. Dianov, “The origin of near-IR luminescence in bismuth-doped silica and germania glasses free of other dopants: First-principle study,” Opt. Mater. Express 3(8), 1059–1074 (2013). Fig. 1. BDFs RIPs (measured by fiber analyzer); inset zooms the core area of the fibers. Fig. 2. Elemental distributions of dopants in preforms (measured by EPMA): (a) all elements; (b) Bi only. Fig. 3. BDFs’ cross sectional images (measured by optical microscope): (a) BLGS (3.31 µm), (b) BYGS (5.24 µm), and (c) BYPS (4.42 µm). Fig. 4. Transmission difference (straight to coiled positions) of fiber samples (a) BYGS and (b) BYPS, revealing spectral positions of cutoff wavelengths (∼830 and ∼630 nm, respectively). Fig. 5. (a)Absorption spectra and (b) base attenuation spectra of BDFs. Fig. 6. PL spectra obtained at different excitation wavelengths of: (a) BLGS, (b) BYGS, and (c) BYPS fibers. In all cases, launched excitation power is fixed to ∼4 mW. BDF lengths are provided in insets. The dashed areas indicate the spectral range of main interest for this study. Fig. 8. Simulated bending loss for LP01 modes of BDFs with 30 cm bending diameter using Optifiber mode analysis software.